The new essay continues my thoughts about whether free will is or isn’t compatible with what we know about the laws of nature. For many years I was convinced that the only way to make free will compatible with physics is to adopt a meaningless definition of free will. The current status is that I cannot exclude it’s compatible. The conflict between physics and free will is that to our best current knowdge everything in the universe is made of a few dozen particles (take or give some more for dark matter) and we know the laws that determine those particles’ behavior. They all work the same way: If you know the state of the universe at one time, you can use the laws to calculate the state of the universe at all other times. This implies that what you do tomorrow is already encoded in the state of the universe today. There is, hence, nothing free about your behavior. I don't know how she can get a Physics PhD and write stuff like that. The universe is not really made of particles. The Heisenberg Uncertainty Principles shows that there are no particles. There are no laws that determine trajectories of particles. 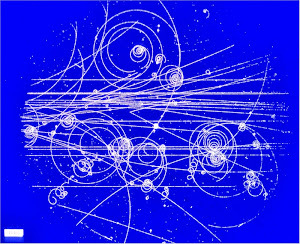 We have theories for how quantum fields evolve, and even predict bubble chamber tracks like the ones on the side of this blog. But it is just not true that the state tomorrow is encoded in the state today. Look at radioactive decay. We have theories that might predict half-life or properties of emissions and other such things, but we cannot say when the decay occurs. For all we know, the atom has a mind of its own and decays when it feels like decaying. The known laws of physics are simply not deterministic in the way that she describes. She goes on to argue that world might still be indeterministic because of some unknown failure to reductionism. In a way, chaos theory is such a failure of reductionism, because deterministic laws give rise in indeterministic physics. But she denies that sort of failure. What she fails to grasp is that quantum mechanics is already compatible with (libertarian) free will. The advocates of many-worlds (MWI) are nuts, but at least they concede that quantum mechanics does not determine your future (in this world). It makes for a range of future possibilites, and your choices will affect which of those possibilities you will get. Of course the MWI advocates believe that every time you make a choice, you create an evil twin who gets the world with the opposite choice. That belief has no scientific substance to it. But the first part, saying that quantum mechanics allows free choices, is correct. The other FQXI contest winners also have dubious physics, and perhaps I will comment on other essays. The problem is that such claimed indeterminism possibly has nothing to do with brain states. They could be as determined as a ball rolling down a hill. What is your proof that brain states involve quantum phenomena? Thanks for calling Hossenfelder out on this. You should have read the entire article before commenting. Sabine admits that because of quantum mechanics, what is predicted is calculated 'probabilities', which means that you never will have a certainty of what will happen given the randomness which creeps into all interactions, and given enough action/reactions in time, your degree certainty deteriorates. You simply can NOT have all the information, nor do you have absolute precision with your measurements, it's on these things your calculations ALWAYS depend. This is basically a convoluted unicorn argument. 'IF' I had a unicorn, the following could be calculated with certainty...well, you don't have a unicorn, and being a finite mortal, you never will, so why is anyone pretending otherwise? The entire reason the argument is even being entertained, is because certain people do not want other people to believe in free will (for primarily privately held political purposes), it is the source of all culpability, from which they are desperately trying to rid themselves. Once you have eliminated free will, freedom also evaporates, as you can pretty much justify anything you do to someone else as 'inevitable'. Hitler: "It was my destiny to order millions of people shoved into ovens." <--and be considered correct. Mao: "There was no point in not killing over ten million people, as they literally had it coming, I had no choice in the matter." <--and be considered correct. Pray tell, how would anyone be held accountable for anything if it could be scientifically demonstrated they had no ability to change the outcome? You couldn't. Free will has NOTHING to do with politics! If things are deterministic, then it applies to anything individuals or groups of individuals do. The only issue that arises is when neuroscience is capable of actually predicting behavior. Given the chaos and complexity of the environment and biology, this is not likely to ever happen. However, seeing common neurological wirings in people like criminals might RIGHTLY suggest intervention. If a criminal needs to be shamed and socially pressured, then such cultural practices would only be more justified. What conservatives rightly fear is psuedo-arguments that somehow connect determinism and permissiveness. Such attitudes do not logically follow. However, empirical examination of biblical justice arguments are certainly justified. What I think will certainly find some justification in the future is EUGENICS but not a vindicative and prejudiced kind. What conservatives seem to dismiss is how much poor breeding has led to poverty, crime and health issues for society. They promote rampant and thoughtless breeding. I think that is more horrific than reductions of certain "freedoms." The political arguments that are meaningful about freedom have to do with a balance between its negative and positive variates. Ask a libertarian about work or private spaces and then they become advocates of total tyranny. Wait until corporate America becomes more PC than academia. They're hypocrites when it comes to freedom. I should mention that capitalism is the most physically wasteful system ever constructed. We even throw away half of the food! Half the IT industry exists for no other purpose but to create makework and pollution with planned obsolescence and overpowered hardware (bloated software slows machines to the point that a Pentium II could otherwise do most of today's computing--for instance see KolibriOS). In 2014, approximately 41.8 million tons of e-waste was generated worldwide. We can't even create walkable neighborhoods and towns, while we have a artery-clogging fast-food joint or drugstore on every major corner. Oil consumption (finite resource) is now at 100 million barrels per day. Vance Packard described the incentives for waste a long time ago. Capitalists can't even claim to create less bureaucracy than socialism anymore. Capitalism only looks bad...until you compare it to everything else, then it starts to look downright beautiful. My father lived under the glorious communist party and it's progressive social eddicts. When you separate a man from the rewards of his own efforts, you are stealing his life while denying him a chance to find his own progress. Living a good life is not something you can impose on someone else. Lasch: Conservatives conceive the capitalist economy as it was in the time of Adam Smith, when property was still distributed fairly widely, businesses were individually owned, and commodities still retained something of the character of useful objects. Their notion of free enterprise takes no account of the forces that have transformed capitalism from within: the rise of the corporation, the bureaucratization of business, the increasing insignificance of private property, and the shift from a work ethic to a consumption ethic. Insofar as conservatives take any note of these developments at all, they attribute them solely to government interference and regulation. They deplore bureaucracy but see only its public face, missing the prevalence of bureaucracy in the private sector. They betray no acquaintance with the rich historical scholarship which shows that the expansion of the public sector came about, in part, in response to pressure from the corporations themselves. Not only do conservatives have no understanding of modern capitalism, they have a distorted understanding of the “traditional values” they claim to defend. The virtues they want to revive are the pioneer virtues: rugged individualism, boosterism, rapacity, a sentimental deference to women, and a willingness to resort to force. These values are “traditional” only in the sense that they are celebrated in the traditional myth of the Wild West and embodied in the Western hero, the prototypical American lurking in the background, often in the very foreground, of conservative ideology. In their implications and inner meaning, these individualist values are themselves profoundly anti-traditional. Physicists often incorrectly say ``deterministic'' when they should be saying ``causal.'' And even by ``causal,'' they mean many smaller things like ``bound in a strict temporal sequence'' whereas what they should be saying ought to be: ``actions in accordance with the identity or the basic nature of the entities that act.'' The nature of an entity is the cause, and the actions it takes reflect its identity and are effects. So, that's confusion #1 they make. There are other confusions, too. The world (which term includes living beings) is not deterministic, period. For that matter, good arguments can be made that even when it comes to just the physical world (i.e. the inanimate beings or the inanimate aspects of the living beings), we can't say that it is fully deterministic. 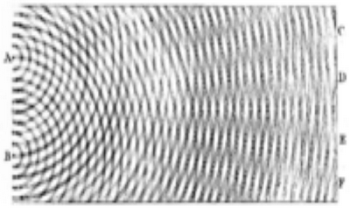 Deterministic chaos or turbulence provide good examples right from classical mechanics. Further, physicists don't think of the ranges of measurements. Very large or very small quantities do not make much epistemological sense. The scope of definitions of physical quantities itself is, in principle, restricted to a finite range of measures/sizes. To extrapolate beyond such a range can be reasonable, but not always. One must remember that as you set out to extrapolate from the defining interval to an interval lying very greatly outside it, the very conceptual relevance of the defining interval goes on decreasing. Extrapolation ``up to'' infinity (whether for the infinitely large or the infinitely small) is permissible only as a means of abstraction, and it is to be understood that such an abstraction itself has its validity directly grounded only over the defining interval. One must always bear this aspect in mind when it comes to applying a mathematical theory of physics to concrete reality. To say that the physical world will always be found to be causal at any distance away from earth is not the same saying that the set of fundamental laws would also remain valid over all possible distances. The error is conceptual. But physicists often blithely make it. I think you yourself wrote about these two points some time ago on this blog---about (the absence of ``determinism'' in physics and about the senselessness of very large or very small numbers). Finally, physicists must realize that by the very nature of the science they study---its methods and contents---it is incapable of studying any of the non-physical aspects shown by the living beings. It almost seems rhetorical, but it is easy for physicists to forget when they have left the domain of physics (of physical bodies or only the physical aspects of the living beings) and entered the domain of living beings proper. The principle of conservation of momentum of course applies to the car driver but only to his bodily attributes. It does not determine the road he takes (or how he presses his fingers at the keyboard---whether to write sensible things or garbage). That's free will. One final point, which I made at Scott Aaronson's blog several years ago. You don't need QM in order to commit the error of inserting consciousness into a physical theory. You can do the same also with the Newtonian particle mechanics. Application of physical theories can involve non-physical attributes (such as life, consciousness, free-will). However, physical theory proper cannot include them internal to itself. That's the point. Guess I will post this reply as a separate entry at my blog too. Thanks for the opportunity to ``vent out'' though!